For one-handed use when measuring SCI and SCE numerical gloss control simultaneously, the instrument of choice is Konica Minolta’s CM-2500d handheld spectrophotometer. Specifically designed for easy use, the CM-2500d is the first instrument of its kind to scientifically lower the time spent on measurement and calibration procedures through patented numerical UV control. 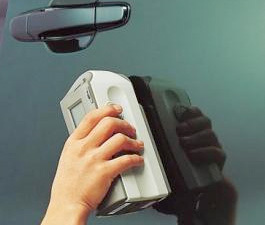 Only two controls are needed to operate it – one is a wheel for scrolling through LCD screen displays; the other a button to perform measurements. The advanced, portable CM-2500d Spectrophotometer features an ergonomic shape that fits easily into your hand. It has a bright viewfinder and allows you to obtain measurements from a variety of angles. In less than two seconds the unit provides measurements at a startlingly high degree of accuracy. Its two controllers make the CM-2500d Spectrophotometer very user-friendly. One is a button that is used to perform measuring tasks, the other is a wheel similar in function to a computer mouse. It allows a user to scroll through menu items on the large screen and then click to select. Data can be shown either in graphical form or numeric form, making it easy to get information with a glance. Quickly and whenever necessary, you can view colorimetric data with descriptive color difference, L*a*b* color graph with box or elliptical tolerances or pass/fail indications. Users are able to read the CM-2500d Spectrophotometer’s screen in any direction, thanks to display reversing technology. Six languages are available through the built-in software. They include English, French, Italian, Japanese, German and Spanish. Measuring is easier than ever with a bright, illuminated viewer. The LED provides comfortable, true sample viewing on even dark samples with a single touch. The highest quality standards for measuring colors across a wide range of quality control applications is made possible with Konica Minolta’s patented Innovative Optical System. A d/8 sphere features built in numerical UV control and numerical gloss control. The latter produces simultaneous data with SCE (specular component excluded) and SCI (specular component included.) This technology brings about optical results that are truly superior. Because there are no moving parts on the device, it is rugged and stable enough for virtually any portable application. 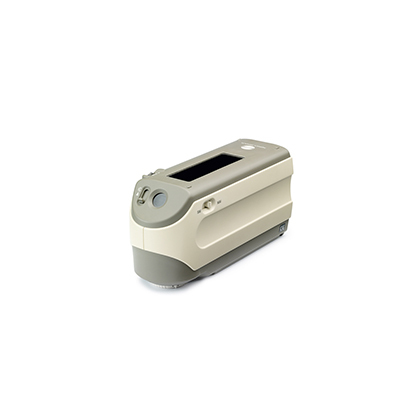 The CM-2500d Spectrophotometer works with SpectraMagic NX software. SpectraMagic is surprisingly simple to use, showing various data result views that users can edit. The primary target’s data can be associated with several targets that are secondary. The result is the ability to accurately measure the difference in colors and other advanced quality control functions. Information management is simple with the instrument’s drag-and-drop feature, which lets users put data into the software and then print directly from the unit. Instrument information can easily be seen through a status window; there are available preconfigured templates; and numerous graphs are accessible to display information. Finally, if you have data stored on older software, you can transfer it over to the newest software, with which it will work seamlessly. In a case where you require Microsoft Excel to show data, there’s a foolproof exportation process to make this happen. The software in the CM-2500d Spectrophotometer also provides a navigation function and color tutorial. withinΔE*ab 0.2 (MAV/SCI) Average for 12BCRA Series II color tiles compared to values measured with master body.